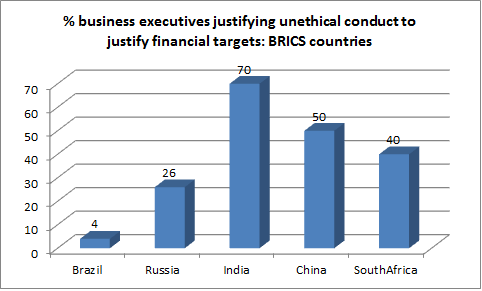 Top global consultants Ernst & Young’s (E&Y’s) 14th Global Fraud Survey has found that a high 39 percent of business executives in India believe that “bribery/corrupt practices happen widely in business”, which is one of the highest in the world. Of the 57 countries surveyed, a higher percent of business executives of just 16 countries talked of existence of the malaise. The world average is 39 percent of business executives holding a similar view. Further, 70 percent of India's business executives surveyed said such actions can be “justified to meet financial targets”. Here, too, a higher percent of executives of merely six of the 57 countries surveyed held a similar view. Among BRICS countries, Brazil's 4 percent, Russia's 26 percent, China's 50 percent, and South Africa's 40 percent business executives think that way. The results also show that 44 percent of business executives of India expressed concern regarding unethical conduct at work; 58 percent believed that bribery and corruption was widespread in India; and 30 percent stated that loyalty to their company would prevent them from reporting an incident of fraud, bribery or corruption. Titled “Corporate misconduct — individual consequences Global enforcement focuses the spotlight on executive integrity”, the survey report, in its commentary on India, ironically, praises “government-led initiatives, including tax reforms, regulatory improvements and the Make in India initiative”. “In 2016, as part of its commitment against corruption, the Indian Supreme Court expanded the definition of a public servant to include private bankers. This move, while clearly impacting the financial sector, is expected to have a broader impact on other highly-regulated sectors.”, the report says. In all, between October 2015 and January 2016, E&Y researchers, in alliance with the global market research agency Ipsos MORI, conducted 2,825 interviews with senior decision makers in a sample of the largest companies in 57 countries.